translation in English of "La Clef des Sons"
Re: the book by Dr. Bernard Auriol, La clef des sons. I would like to give a strong recommendation for the publication in English of the book by Dr. Bernard Auriol, La clef des sons. I sincerely believe that this book should interest a wide public in the English- reading community. I have some experience in the field, since I wrote the chapter on Musical Acoustics in the Volume "Hearing" of the Handbook of Perception published by Academic Press, as well as several chapters or contributions in books published by M.I.T. Press, Freeman, Kaufman and others. I find the book of Bernard Auriol of great interest - this is why I wrote the foreword for it. The field of sound communication is too often neglected, and so is the sense of hearing. Yet it is through hearing that the newborn baby gets its first messages from the outside world (beyond his mother). Hearing is an extraordinarily sensitive sense, a special kind of remote touch which conveys useful information about changes in the outside world. It has developed highly refined mechanisms in the brain as well as in the outer, middle and inner ear. Hence hearing and listening are essential for awareness, for communication - speech, music - , for mental therapy. Dr. Auriol has a background which enabled him to write his ambitious book concerning many aspects of hearing. He is a psychiatrist who uses sound as part of his therapy. Hence he has direct experience of the effects of sound, and he is in a very special position to speak in a profound way about the mechanisms of hearing and its deep roots in the human individual and collective mentality. Dr. Auriol is at the same time an acoustician. Unlike Dr. Tomatis, a pioneer of sound therapy whose scientific statements are hazardous, he is very cautious in his claims, carefully separating speculation from evidence. His book is quite exceptional in that it deals with the sense of hearing at different levels, from basic physiology up to cognitive and affective aspects - including mythology, which should interest many readers. The chapters about sound therapy are of interest to specialists, but also to readers interested in personal psychological problems. I know of no book like La clef des sons, and I strongly recommend making it available in the English language. I read your book, La Clef Des Sons - éléments de psychosonique, published in France by the Editions Erès, with great interest. In my opinion, this work on the psychophysiological effects of sounds is the most outstanding treatise on the new branch of scientific exploration you designate as Psychosonics. As a practicing professional clinical psychologist, I am looking forward to the applications of your work for the treatment of a variety of psychological and psychosomatic conditions. Furthermore, the re- education of the ear with the exercises you describe for the stimulation of auditory functions will be of particular interest for audiologists, pediatricians, musicians and educators. Since sound and music affect us all, it behooves us to explore their effects to enhance the quality of our lives. In our electronic age, the possibilities of electronically produced sound are enormous, but need to be based on accurate scientific knowledge for their wise application. In brief, your book is a landmark. I hope it will be translated and published in the English language as soon as possible. As the former director of the Psychophysiological Research Laboratory of the U.S. Veterans Administration Neuropsychiatric Hospital, in Los Angeles, and for many years President of an international foundation which attempts to integrate the best that Western Europe and America can offer in psychology, behavioral medicine and related fields, I am eagerly awaiting the American publication of your book to recommend it to my English- speaking colleagues on both sides of the Atlantic. Although many books have dealt, in exhaustive detail, with the physiological mecha­nisms of sounds as well as with their psychological significance and their characteristics, this book provides a multidisciplinary, innovative contribution to the field, and it constitutes a first- time anthropological synthesis of the fundamental role played by sound environment in the development of the personality, emotional investment, and treatment of the individual. The book is composed of thirteen chapters followed by both a bibliography and an index which are as eclectic as they are well- documented. In the beginning chapters, the book addresses the physiology of hearing in all the semantic complexity of its biological adaptive mechanisms [ethology, comparative psychology, phylogenesis, ontogeny (uterine life)]. Subsequent chapters assign considerable space to the psychophysiological and psychosoma­tic dimension of the effects of sound (e.g. intensity, frequency, resonance) on the organism. These theoretical studies are supported and reinforced by clinical and experimental research carried out by the author, whose results are amply discussed in the light of contemporary me­dical and scientific inquiry (e.g. hemispheric specialization, cortical dominance, the auditory system and its functional laterality). The final chapters of the book, which are equally as interesting as the others, deal with the psychophysiological problem of the signifcance of sound throughout the various types of cultures and civilizations. Because of this fact, the author's anthropological conclusions are of the greatest interest in comparative medicine as well as in the therapeutics of neurology and psychiatry. Taking into account the multidisciplinary richness of the subject dealt with, we esteem that neurologist- psychiatrist Dr. Bernard Auriol has produced a truly comprehensive and scholarly work. Ranging from psychoanalysis (effects of sound) on conscious and uncons­cious motivation to behavioral phenomenology and clinical neuroscience, this book constitu­tes an excellent source of reference not only for physicians (whether pediatricians, neurolo­gists or psychiatrists), psychologists, social workers, and educationalists, but also, more ge­nerally speaking, for all specialists in the Social Sciences. The concept of psychosonics, as developed by the author, should prove to be of great interest to research workers and clini­cians. In view of this fact and the author's innovative approach, the book is highly suitable for wide distribution not only in Europe but also on the North- American continent. The com­pact chapters of this book attain high academic standards and deserve the sustained scientific and clinical profound consideration. I am very pleased to have the opportunity to express my interest in the quality of the work and achievments of Bernard Auriol, MD as they appear in his last book : L.a Clef des Sons, éléments de psychosonique, Erès, 1991. The voice is a major problem in the contemporary theatre practice and studies in Europe. It has been paralyzed for a very long time because of the loss of traditional techniques and the growing importance of vïsual stimulations in drama performances. Theatre is still often considered in France as an art of "pure emotion", or as a part of literature. Furthermore, there exists a conflict among the body virtuosity and the vocal in many acting styles. 1- a strong professional ability as a psychiatrist and a scientific researcher. 2- an interdisciplinary perspective, including precise knowledge of foreign patterns and cultures. 3- an interest in scientific disciplines as well as a spiritual view of Human Consciousness. 4- a prospective sense for artistic and scientific research. 5- human qualities which allow him to be an active leader for students, and a very good fellow with colleagues. The qualities that I expose here illustrate why I recommend the translation of his book in English. Pr Jean- Marie Pradier, Ph. 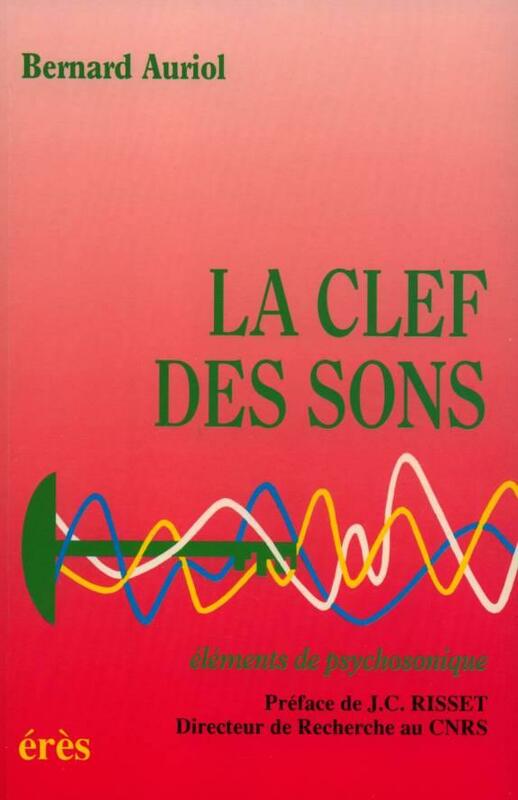 D.
I have read the French edition of the book "La clef des Sons: Elements de Psychosonique" by Dr Bernard Auriol. My own area of research is in the domain of cognition, and more particularly in the theory of learning and memory. As an experimentalist I have used auditory stimuli as triggers to information processing during cognitive tasks. And I have also recorded the evoked and event- related potentials elicited by these auditory stimuli. But there was always some frustration at the moment of. the interpretation of the functional significance of the early evoked components. I had always the impression that the early perceptual stages of audition were much less clearly elucidated than the corresponding visual stages. This book which combines clinical investigations and theory of sound perception is therefore very welcome. It will contribute to restablish the balance in the volume of publications with the corresponding visual domain. For different reasons, the demand for comprehensive treatment of such subject is expanding. These are some of the reasons that make the publication of such a book in English highly recommendable. It will make a significant contri­bution to this rapidly developing field of research. About : La Clef des sons, Eléments de Psychosonique; Toulouse, Ed Erès, 1991, 287 pp. and secondly, to whom is it directed ? What does this key allow the reader to reach ? It allows him or her access the world of sound; or more specifically, invites us to a polyphony. One is reminded of the anatomy and physiology of the ear; the most recent scientific data have been compiled to tell the tale of the odyssey of the learning of language as and from the life of the foetus. However, this work also has the secondary title “Elements of psychosonics”, and is therefore not simply a treatise on sound. In fact, as well as being the regional secretary of the "Société Française d'Acoustique” (French Acoustics Society), the author is also a psychiatrist who specialises in Sonic Therapy. He offers the reader the results of his reflections, based upon both his extensive research and clinical experience, and, in particular fifteen years' work with the so- called "electronic ear". Furthermore if we add that Auriol is both psychoanalyst and indianist, the vastness of the synthesis he proposes can be seen. The author's preceding works deal with relaxation and yogatherapy. Such varied and extensive expertise allows Auriol to make links between various domains in a way which would be beyond most theorists. For example, one is easily convinced by the parallels the author draws between tantric somatotopy and the Hebrew Kaballah. Similarly, the Freudian stages of psycho genetic development converge with the yogic experience of the chakras. It is easy to answer the second question : who can profit by reading The Key to Sound ? The professional stands to gain from the experience, as does the layman; the latter is supplied with all of the elements necessary to confidently explore the sonic universe. He or She will learn, for example, how to obtain and make sense of an audiogram. The practitioner, musician, paediatrician, psychologist, speech therapist, psychotherapist, or other - will further his or her education by learning about the most recent developments in this field, such as the work done on somatisation and listening thresholds. Both the initiate and the layman will find satisfaction in knowing about the basis of classical musicotherapy or about "sonic cures". At least two other positive qualities come to light in Bernard Auriol's work; it is both learned and a pleasure to read. In this book technical writing goes hand in hand with literary culture and history. Descriptions of recent technology are illustrated with appropriate references. Orpheus calmed wild beasts with his lyre; like Pythagoras, Confucius saw in music a source of harmony and happiness; the Turk Suliman II sent away the fanfare given to him by the French King François I, because of its mellowing effect. Furthermore, the author reveals himself to have a rare disposition ?one which allows him to make prudent conclusions. At all times, he keeps the modesty found only on those who have the audacity to leave behind them the reassuring walls that contain their speciality. Finally, in reading The Key to Sound , we are able to expose our minds to a fundamental plane of man's existence, Man who speaks and listens. Humanity's entire tradition of thought, especially in terms of philosophy, has given vision a higher, more privileged rank amongst the senses. Auriol invites the reader to make use of his or her hearing; paradoxically in allowing ourselves to listen to what is said in this book, we enlarge our vision of the world. This book merits world?wide consideration, which requires the participation of an Englishspeaking public; in all evidence this legitimises the necessity of translating The Key to Sound into English. 'The Key of Sound: Elements of psychosonics"
In this book they will find fascinating relationships drawn between the "heard" and various neurological and psychological activities which will bring them to an understanding of the different functions ; an understanding which is not available to them in "classical" works written on the subject of hearing. This characteristic of the book is enhanced by the fact that B. Auriol is a psychiatrist and a psychoanalyst of an ability which enables him to see all the possibilities of listening in a field which is fundamentally his own. The Work by Dr. B.M. AURIOL, MD offers an original point of view and revisits the question of the relationship between sound dimension and the development of the human being, with special reference to listening. This book merits a wide readership both in France and abroad. A critical analysis of the work of B.M. AURIOL. by E. LECOURT, Professor of Clinical Psychology and Psycho pathology at the University of Louis Pasteur (Strasbourg - France). This work is a synthesis of general data concerning the sense of hearing. It traces the development of an original practice mainly based on two lires of thought : the first being the Tomatis Theory while the second refers to lacanian psychoanalysis, both of these are treated critically. - measurements such as : audiometry, discrimination tests, listening tests, etc. - the effect of sounds on the human being. - Voice i.e. the audio- phonatory and phono- auditory loop feedback system. The author, then, develops his idea of therapy by sound which he calls sonotherapy and which he defines as being 'a set of therapeutic procedures exploiting the interaction between the patient and a sonorous environment, designed to achieve a positive change of the patient’s organism. Also he mentions several practices, from the use of cassettes for relaxation purposes to various methods of musicotherapy. This time he uses the idea of listening modification brought about by 'listening modifier devices' (LMD) such as amplifiers and piloted- filters (a filter which is piloted by the source of the sound itself). By developing the "Tomatis'electronic ear", "Isa Beller's semiophone", Berard's filter and other devices, the author proposes a "variophone" and then, in collaboration with Thourel, an "akousmatix". The object of this 'sonotherapy' is thus to modify the hearing of the subject. The term "sonotherapy" is the general concept from which is derived musicotherapy. In one single word it brings together many practices from mechanical modification of listening to psychotherapeutic approaches. This work also includes a large bibliography of these subjects. What is original in this book is the synthesis of knowledge of hearing and its importance on the development of the individual throughout his life; synthesis which links the anatomo- physiological, psychological, even philosophical aspects, then goes beyond this, developing its own critical position and personal practice. The author successfully draws on his deep knowledge and long clinical practice in this field. The book of Bernard AURIOL is a very original one. It deals with sounds, in their specific aspect leading to their effects on human body and behaviour. Bernard AURIOL is a psychiatrist who used sounds for a long time as therapy, so he is very experienced in it. This new approach of sounds is well informed on the subject, including the own works of the author. The book is divided into several parts, beginning with a detailed presentation of hearing: anatomy and physiology. The second chapter is very interesting and it is a mine of true examples of the effects of sound on child mixing hearing and voice effects to explain how sound acts on the child development. A following chapter shows how the pitch and duration discriminations can be used in a therapy process, especially in a scholing goal. Then, some ef£ects of sound on man are explained, such as subliminal messages or the effects of frequency, rythm or infra sounds. A specific topic is also approached with regard to its medical involvements: I mean the problem of laterality, first in its general aspects and then in its acoustic developments with clinic examples. The book continues with a large place given to, let us say, the "sonic therapy": how to use either the voice or the hearing, or both, to proceed through a suitable therapy. Some special techniques and equipments (some of them developed by the author) are described. The author study some disorders and recommend the well use of sound to proceed them, in a very practical way. Finally, the author teaches us with some unusual aspects of sound: the relation be­tween "chakras" and audiograms or the problem of cohabitation of psychoanalysis and hearing. This is a very attractive book, plentiful of ideas, examples and new concepts, written in a very clear and precise style, with a touch of humour. The author gives the reader all his experience in the sonic therapy he uses since more than 10 years. The book includes a rich bibliography going up to more than 500 titles. It is dedicated to all people interested in the medical effects of sound, and also to practicians of sound (psychologists, musicians, orthophonists, paediatricians, ...) in which they will find all what they need to form or improve themselves in the field of psychosonics. Written in TOULOUSE (FRANCE) on Thursday November, 12th 1992. Claude LEGROS, Professor of Acoustics. Member of Société Française d'Acoustique. Member of Acoustical Society of America. Member of Aerospace Medical Association. The book of Doctor Bernard AURIOL "La clé des sons" studies sounds and their effects on human being. It joins all the available data on the topic : anatomy, psychophysiology, experimental researches and clinical works. It is a huge synthesis of data assembled during 15 years. It seems to me a basical book on this new subject, with a good scientific level and a lot of daily applications. So I warmly recommend its translation in English and its quick publication. I think it would be of great general interest that B. AURIOL's book "LA CLEF DES SONS" be published, for several reasons. Firstly, the vastness of the knowledge and the originality of the ideas contained in this book are more impressive. Furthermore, it looks into such unexplored areas as the effects of sound on man according to volume, rhythm, frequencies, whose mysteries are revealed to us through the knowledge of Bernard AURIOL. As well as this, he introduces a very original therapy that would be of interest to a large readership. I havé looked over the recent French publication of the book "La Clef des Sons: Eléments de Psychosonique" by Bernard Auriol, and have discussed the contents with my colleague Dr. Jean- Paul Banquet. This book seems particularly interesting due its combination of clinical investigations of sound perception and the theory thereof. My own area of research is also in audition. The topic has in the past lagged behind vision in attracting research dollars and attention, but has in the last decade began to catch up. Tools for manipulating sounds on popular personal computers have recently become affordable to everyone. Thus, the demand for comprehensive treatment of the subject matter is exploding, as can be seen, for example, from the popularity of Al Bregman's book "Auditory Scene Analysis." France is well known as a center of expertise in sound processing and audition. I would very much like to see the book published in English, and believe it would make a valuable contribution to the literature in the area.